I’m a big fan of anything Japanese, especially the food. So when I’m looking for inspiration, I often look to Humble Bean, a gorgeous blog that makes me nostalgic for the place that’s like my second home. While perusing Azusa’s posts the other day I noticed her braised daikon and chicken recipe and decided to try it out, TheOccasionalVegan-style, using Beyond Meat as a chicken replacement. It turned out well, so I’m sharing my version with you today. Azusa mentions in her post that the dish is meant to be appetizer-sized, and that the broth would likely be too salty to sip. I was in the mood for an entree and decided to add more shiitake broth in an attempt to reduce the salty overtones and make for more of a dinner-sized portion. 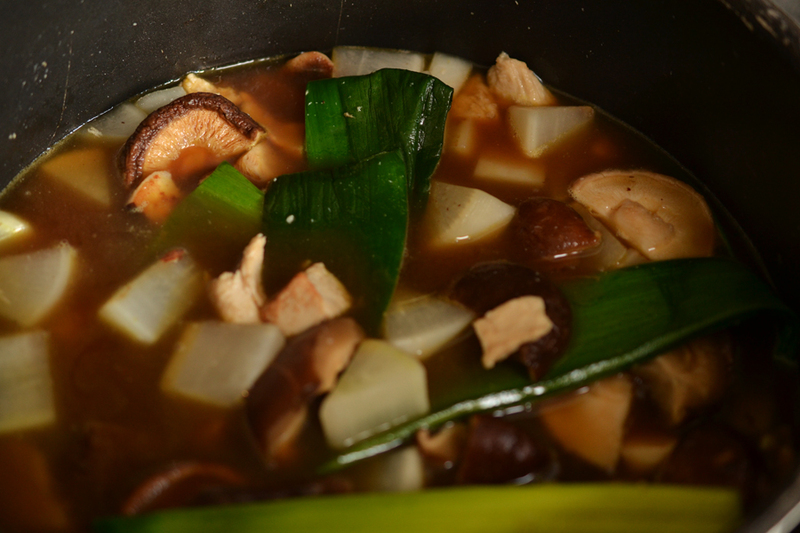 Better than Bouillon No-Chicken broth substitutes for the meaty alternative, and I took her suggestion to swap half of the reconstituted mushrooms with fresh ones (though the texture isn’t that different than the reconstituted ones, so it’s optional). The resulting final product is light, not too salty, and while still not brothy enough to be considered a proper stew, it definitely satiates a dinner-sized hunger. 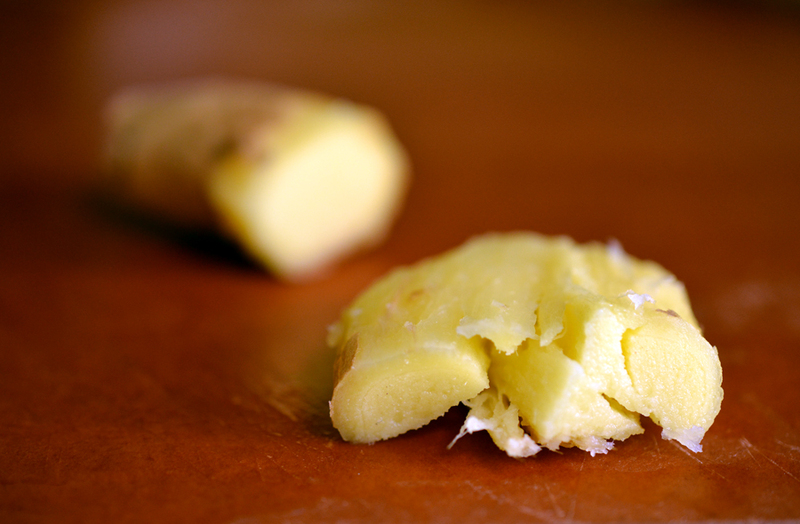 Before getting to the recipe, let’s talk ingredients. If you haven’t worked with some of these before, here’s a few tips. 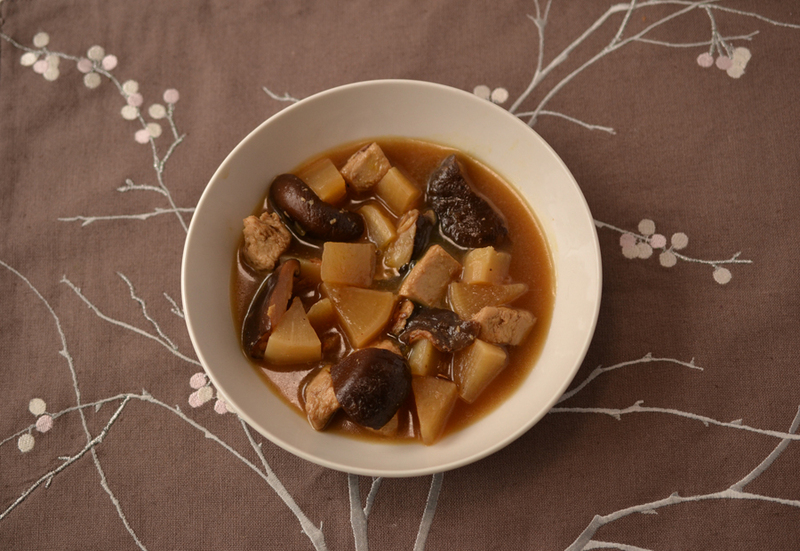 All daikon parts aren’t created equal when it comes to stews. Daikons have two sections with different flavors and (arguably) different purposes. The bottom section tends to be peppery and closer to a ‘normal’ radish, used best raw, pickled, in salads, etc, while the upper section tends to be best suited for slow cooking/simmering and has a sweet, mild flavor when cooked. While this recipe calls for a pound of daikon, and while the dish won’t taste bad if you use the entire daikon, I purchased a daikon that was closer to 2 pounds, cut off the bottom, and used only the top for the recipe. I julienned the bottom half, combined with carrots and a rice vinegar pickling liquid, yielding a crisp, refreshing side salad that went marvelously with the silky, earthy soup. 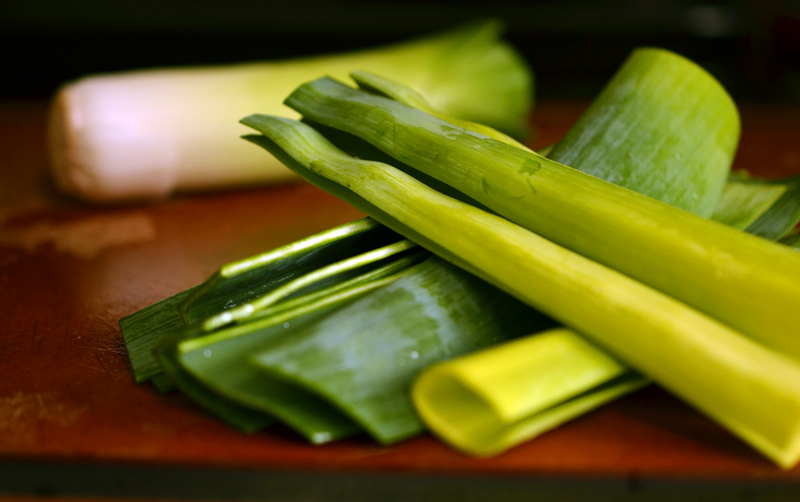 Leeks’ dark green tops are generally considered to be inedible but work marvelously in soup stocks. The bad news is this recipe doesn’t call for anything other than a leek’s top. The good news is you get the rest of the leek for another culinary experiment! Beyond Meat is the best fake chicken I’ve had, and that’s coming from a person who still eats chicken. Having experimented with the ingredient many times at this point, I can safely say that it’s most convincing when either mixed with a strong sauce or browned first (such as via pan frying briefly), as otherwise it does have a bit of a starchy taste. I decided to try out this recipe without browning the Beyond Meat – I marinated it in the rice wine and then threw it into the pot with the daikon and leeks as the original recipe suggests with the chicken thighs. In hindsight, I’d suggest browning it first. While the pictures below suggest otherwise, I’ve amended the recipe’s steps. Katakuriko is an odorless, tasteless potato starch that’s used to thicken soups/sauces or sprinkled over meat before frying. It’s a Japanese ingredient that I found fairly easily at a local asian foods store – or, it’s cheap on Amazon as an add-on product. This was the first time I’d heard of or used katakuriko, and plan on experimenting with it in the future. If you can’t get the product I’d imagine substituting cornstarch would work. Pour boiling water over dried shiitake mushrooms in a large bowl (around 3 cups of water), as you’ll need 2 cups of shiitake liquid at the end. 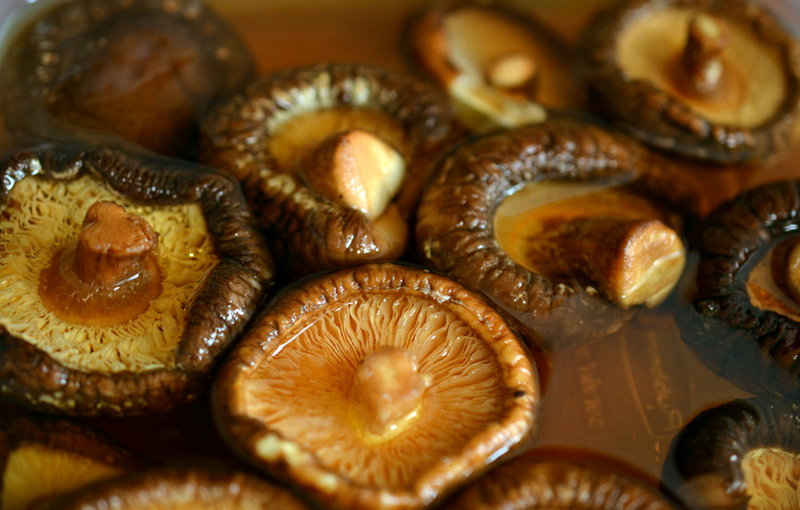 The mushrooms will take time to soak so do this step first. 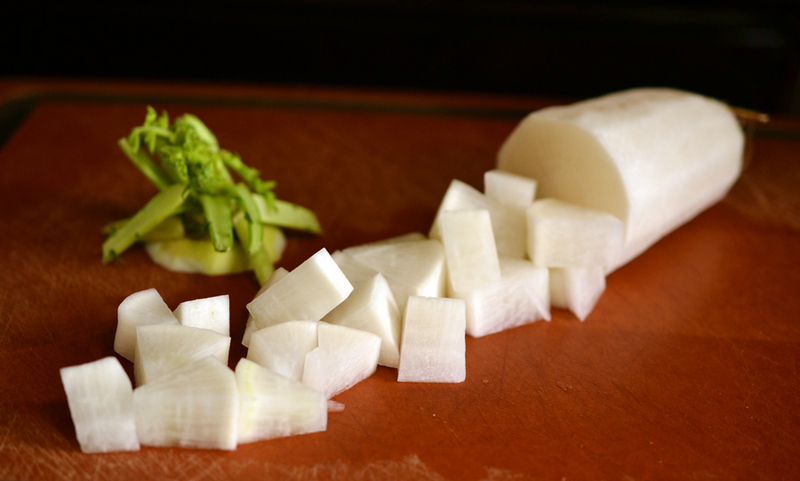 Cut the daikon into 1/2 inch slices and then into smaller pieces – my daikon was large, so I cut each slice into 6 pieces. Go for bite-sized according to your personal tastes. Cut the dark green top off the leek, rinse thoroughly between each of the pieces. Slice them vertically (you’ll have long, thin pieces). Leek sizes can vary; I used around 4 inches of the dark green top, where it’s thickest. Mix Beyond Meat with 3 tsp xiao and a dash of salt and pepper. Marinate while prepping other ingredients. 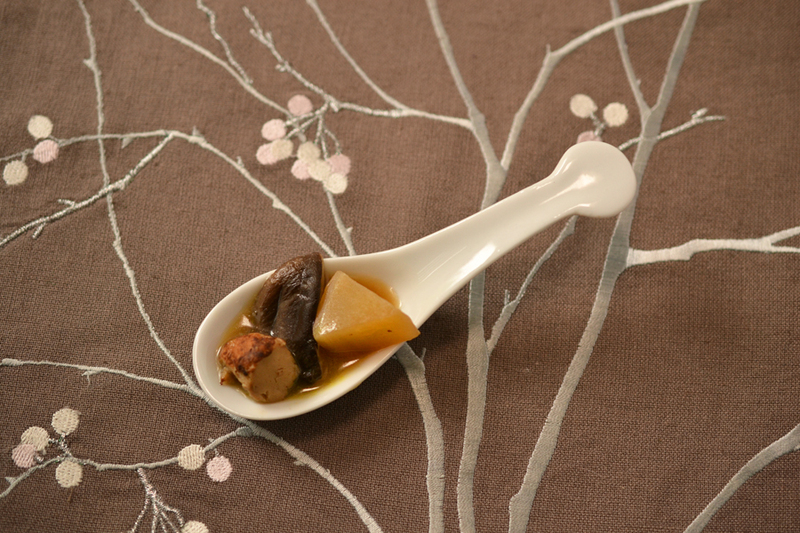 Combine daikon, leeks, fresh shiitake (if using) and ginger in a very large pot with two tablespoons of oil. 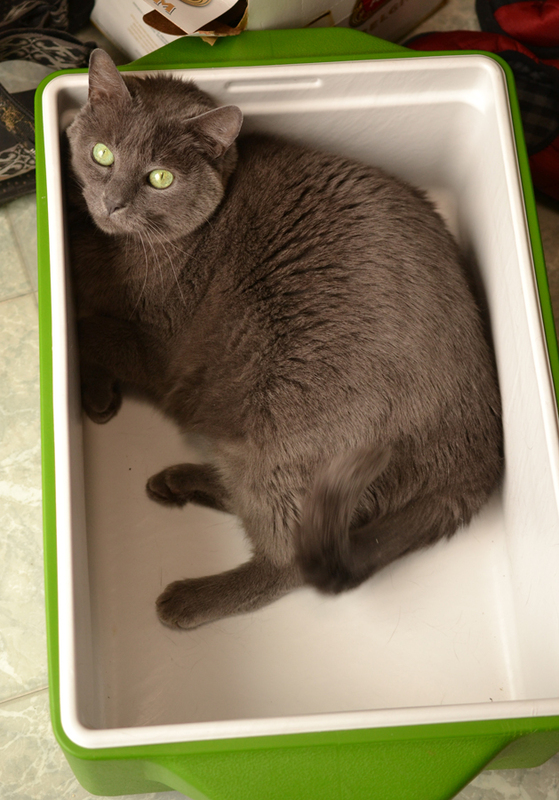 Cook over medium-high heat, stirring frequently to avoid burning, for approximately 5-7 minutes. 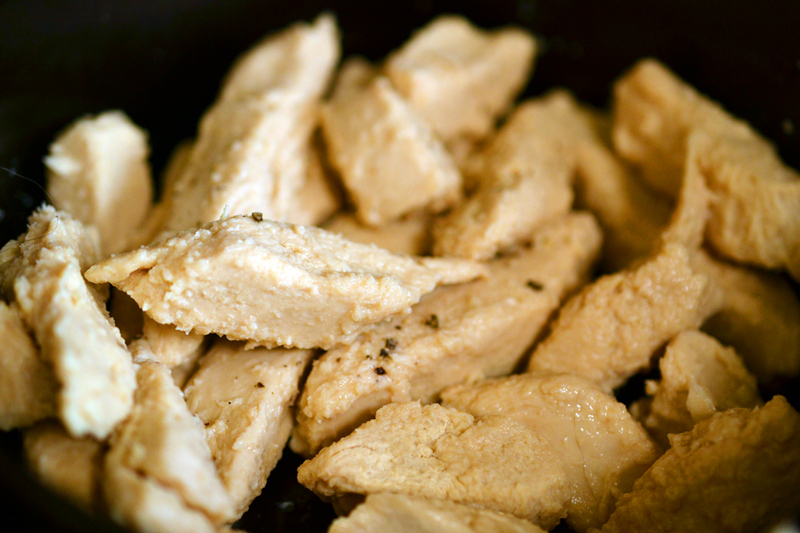 At the same time, dice the Beyond Meat into small, bite-sized pieces and cook in a small pan with oil over medium-high heat until lightly browned. Strain the mushroom broth (it will likely be gritty) through a cheesecloth or just carefully skim the broth from the top of the bowl. You need 1.5 cups of broth. Squeeze the mushrooms to release juice. At this point, discard 5 pieces if you plan on adding the fresh shiitakes. Add all remaining ingredients to the daikon pot except katakuriko and sesame oil and mix well. Bring mixture to boil. Add a foil otoshibuta. If anyone Japanese is reading this and can chime in on if the step is needed for such a large quantity of ingredients, please do! Based on what I read about the item, it’s used to caramelize and evenly cook ingredients. But because I added quite a bit more broth than Azusa’s recipe, I’m not sure if I could have just as easily used a pot lid. The final product didn’t taste caramelized so more investigation is needed. Mix katakuriko with 1 tbsp of water, add to pot and mix well. Cook for a minute or two until the sauce thickens. Drizzle with a small amount of sesame oil (it’s strong so add tiny amounts at a time to taste! ), serve and enjoy. 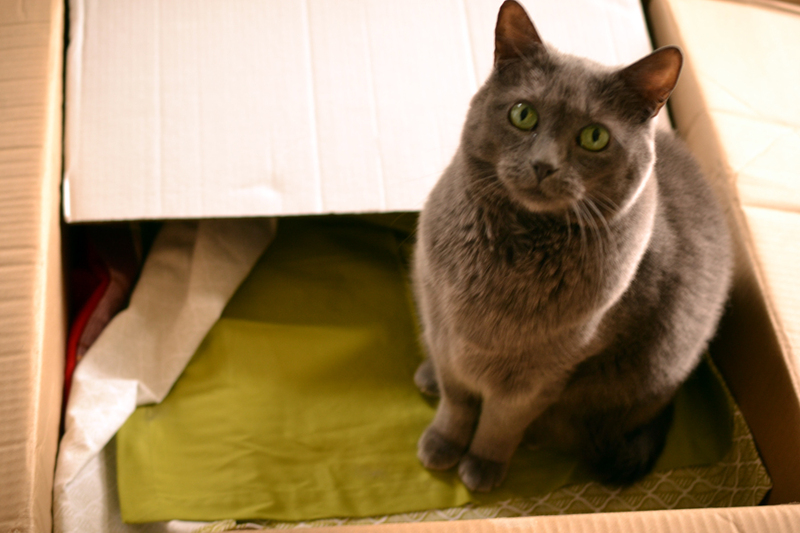 As debuted in my last post, Shiori was being exceptionally ‘helpful’ during this photo shoot. 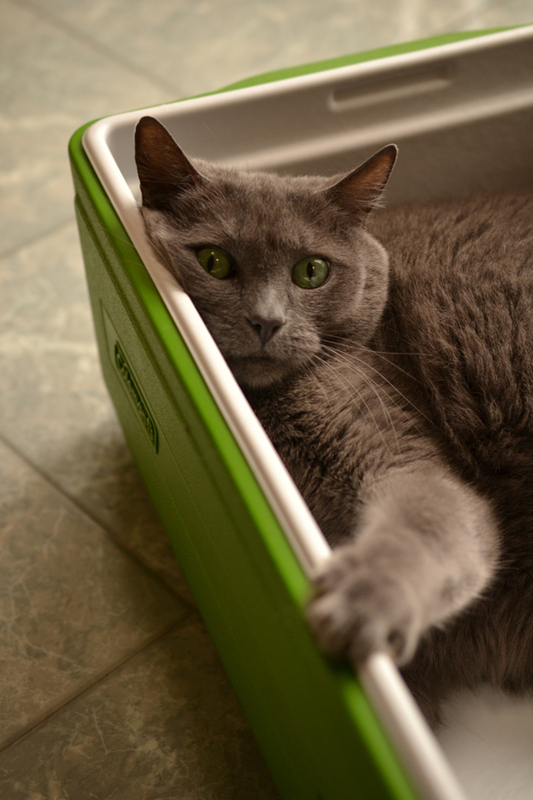 First, she crawled into the placemat box and defiantly stood her ground. Luckily for me, after that she retreated into a drink cooler right next to the shooting setup and kept watch over the process for the rest of the time.